This is a more formal and traditional group. 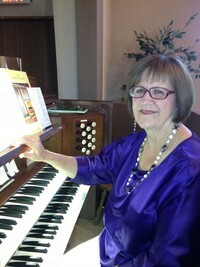 Sue Miller is the director of music at Sierra Arden. This choir has been growing and usually sings in 4 part harmony presenting an anthem each week. In the summer they take a break. If you like to sing, contact Sue Miller; you are welcome to join us. on 2 Wednesday nights at 6:45 PM. The schedule does vary as needed. We also warm up on Sunday mornings at 9:15 AM to prepare for worship.